this post is about shampoo. or more specifically, no shampoo. in my efforts to simplyfy my life and downsize my gear, i spend alot of time evaluating stuff i use, and whether i can find items that are multi-purpose to eliminate redundancy. for instance, i use dr. bronner's for both my bath soap and dish soap and dog shampoo. i have used it as a shampoo, and in a pinch as a toothpaste. i also use it for handwashing clothes. my usual routine for doing my hair has been to use Aussie's shampoo/conditioner combination. the perfumes they use are not too overwhelming, and it definitely leaves my hair soft. but it has been impossible to find these last few months, so i began searching for an alternative. 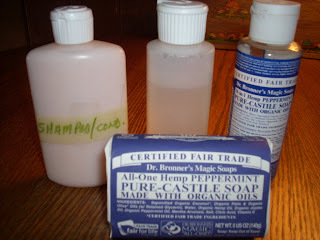 dr. bronners peppermint soap does clean my hair really well, but i didn't want to add a bottle of conditioner to my toiletry kit, so i was googling around the 'net looking to see if there was a different dilution of the bronner's i could use to get softer results. what i found was a whole lot of info and blogs about the no 'poo revolution. seems there are as many reasons to go shampoo-less as there are methods of doing it. some folks want to cut down on the amount of plastics they put into the environment, while some want to cut down on the chemicals they put in their body. some do it for economy, and some for simplicity. after reading some of the websites and blogs and the hundreds of comments from people who have done it, i thought that all of these reasons were valid. if you click on the blog title above, it will take you to an article that will answer some of your questions. blogger is not letting me add extra links for some reason, so google "no poo" or "shampoo alternative" for some great blogs on the topic. what i have found that works pretty well is washing my hair with dr. bronners every 2 or 3 days (no conditioner)with just a quick rinse with water and a scalp massage on the days in between. my hair feels different. it has taken some geting used to. it doesn't feel greasy, just different, and cathy says it doesn't smell funny. now, i've eliminated all the in-between steps, as well as costs and bottles of stuff, to use a mild soap (not toxic, like detergents in shampoo). the oil production in my hair has leveled out, and what i get is just my hair in a state as close to natural as possible. i'm really liking it, considering i used to feel i could do without a daily shower if necessary, as long as i could wash my hair. i am now in the process of growing my hair out, so we'll see how it goes as it gets longer. i LOVE how much more space i have when the seat is reversed. with the new twin bed mattress, i gave up a little bit more floor space, and had no place for the canoe chair. (you can see it folded up on top of the storage drawers on the left in the pic). so i still don't have a place for the canoe chair, but i have a place to sit. i will have to make a decision on the canoe chair sometime before i leave. which brings me back to the state of the rondyvan. the only things i need to have done before heading out again is to flush the radiator and to have a tune-up, which is cool because about $300 will have us roadworthy and milking every last MPG i can. which should keep me in my budget and with a projected leave date of end of september, beginning of october. as usual, i have several directions i want to go all at the same time. i got an invite to come to wisconsin to see a long-time friend who i've never met face-to-face, and of course i gotta head south to find david h. and rile up the Wizard a bit, if i can track him down. vanmom's moving to colorado and i gotta go see her before she changes her mind, and heaven only knows where i'll find NM Brian, mar and bernie, tom, or swankie......ron, well, i know where he lives :-) and heidi and mike have a piece of driveway saved for me......i can't list all the folks i want to meet, or to see again. so many friends to love, and so little time! have i mentioned that i love my life? postscript: i had to laugh. 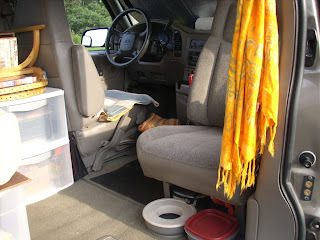 when they got done with the rondyvan today, i got an email that said "your home is finished"!!!! i like playing in my boat. i just visited a place i really like, and got to visit lewis and clark cove, which was overrun with fisherman the last time i was there. i don't know if it is really called that, but Ann and Lexi say it is. but i am skeptical, because they also tell me that the other end of this lake is called "deepest darkest africa", which makes me think they are full of it. i also like to hang out with Mutt. 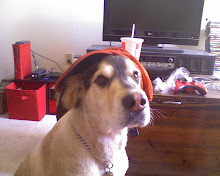 he likes to hang out with me, too, unless i am in the mood to make him wear silly things like hats and babushkas. then he just tolerates me. if i put something on him and say "leave it!" he usually does. after i took this picture he was possesed with the urgent need to snuggle up against sarah's leg, therefore dislodging my REI river cap from his head. how would you describe the look on his face???? 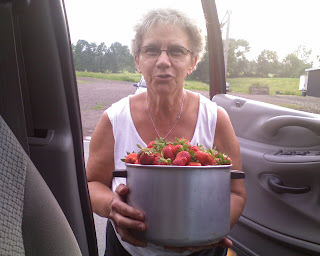 i went picking strawberries with cathy and marge. that is marge below, with strawberries. i think she is saying "don't you DARE" when i took her picture here. 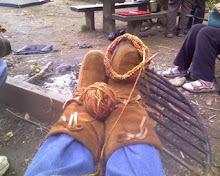 but she did give reluctant permission for me to put it on my blog. she's a good sport. especially on the night that a bunch of us were helping GJ make hay. marge and cathy and i were tossing bales on the wagon while marge's daughter drove the truck. except jenna drove pell mell down the field while Marge (her mom) was still attached to the bale she had just tossed on the wagon. GJ seemed to think it took longer to make hay with us "helping", but i think he never had as much fun making hay without us. 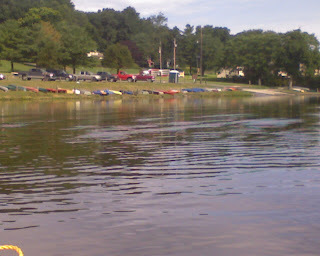 this is a picture of some boats taken at an outfitters down near john and rosie and bobby nomads' place. one of my favorite places to paddle is on secret creek here. the outfitter is called Shank's Mare, and i mention it because i stole their logo for my blogpost title. if you click on the title, it will take you to their website. their logo has become my mantra. 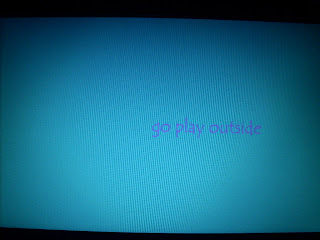 "go play outside"
actually, i never left. so much has been going on, and i'm anxious to catch you all up on stuff. first of all, i put a counter on my blog this month, and am astounded at how many hits i'm getting. i really thought few people read it, so i am humbled and honored by each and every one of you who stops by to see what mutt and i are up to. thank-you. there is alot more to come. soon. i had a recent doctor visit, and all my follow-up labs and ultrasounds are good.....cancer free, if not "cured", and determined to stay that way.....i am being compliant with my med dosage, and will continue to do so. i don't have a follow up visit for one whole year :-) so that is good! i will deal with the discomforts of the meds....that ends up being alot less drama in the long run. so of course, i hit the road the next day. called the specialist from the slabs and said i'd have to reschedule. are you suprised? so my vision is rough right now ......i can't do more than a few minutes on the computer or a few pages in a book before i can't read anything. this is apparently something this new doc can fix, so i gotta be patient. so please be patient with me! 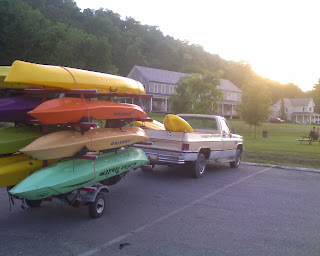 i have lots to yak about. my internet presence has been real minimal everywhere, and do virtually nothing by email or text message anymore. anything i do will be here, at night when i can "sleep it off" afterwards. just as a little teaser, though, the title of my next blog is gonna be "to poo, or not to poo?" you'll love it!